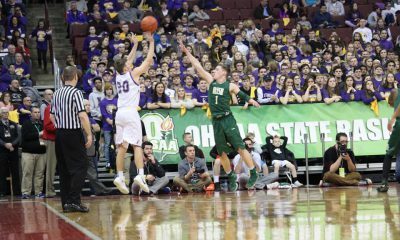 COLUMBUS, OHIO— The final day of the boys’ high school basketball season started with a double overtime thriller. 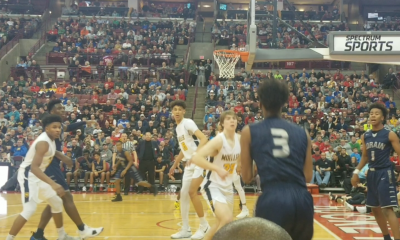 In front of 9,620 excited fans, Maria Stein Marion Local defeated Willoughby Cornerstone Christian 52-51 to take the OHSAA Division IV crown. 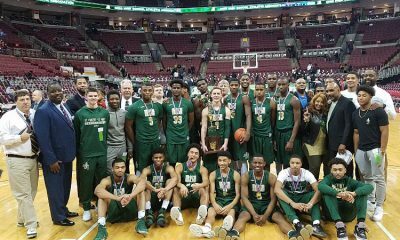 Marion Local (25-4) won their third championship in school history, with previous titles in 1975 and 2003. Cornerstone Christian (21-8) was seeking their second championship after taking home the trophy in 2016. The entire game was evenly played with neither team able to get a lead greater than five points. CCA enjoyed their last 5-point lead, 39-34, when Kendall Saunders put in a reverse layup with 5:16 remaining in regulation. The Patriots then ran off more than three minutes of time on the game clock against the Marion Local zone, but were unable to score. The Flyers’ Nathan Bruns, who tied for the team high in scoring with 18, hit a 3-pointer from the corner with 1:47 to play bringing the CCA lead down to 39-37. 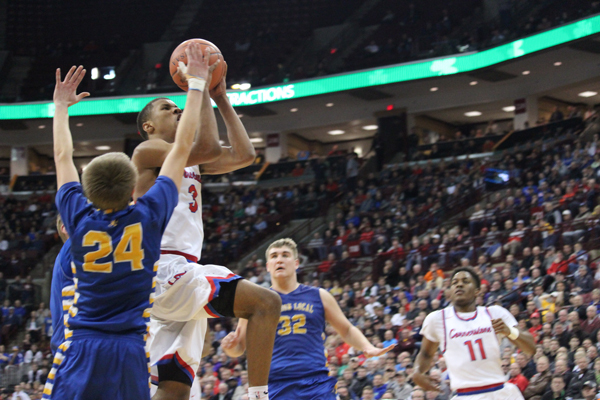 Cornerstone Christian’s Michael Bothwell, who led all scorers in the game with 23, had a chance to give the Patriots a two-possession lead when he was fouled with 39 seconds on the clock. He missed the front end of the one-and-one though, giving Marion Local new life. Tyler Mescher, co-leader in scoring on the day for the Flyers with 18, put in a layup with 0:19 to play tying the score at 39. CCA was guarded closely on the ensuing play and was only able to get off a long shot that fell short at the buzzer. There was no scoring by either team in the first overtime until Cornerstone’s Ricky Adams sank two free throws with 1:44 to play. Saunders followed up with a basket at the 1:07 mark and things were looking good for the Patriots. But the Flyers refused to fold. Collin Everman scored his only points of the game on a layup with 45 seconds to play, bringing the score to 43-41 in favor of CCA. With 30 seconds on the clock, the Patriots’ Bothwell split two free throws, but Bruns hit another corner three with 0:17 to play and we were tied at 44. The Patriots missed a final shot at the buzzer and it was on to a second overtime. Again, Cornerstone Christian took an early lead when Titus Wheeler sank two free throws just 10 seconds into the second O/T session. A layup by Bothwell gave the Patriots a 48-44 lead with 2:32 to play. But again, the Flyers refused to fold. With 2:25 to play, Nathan Bruns—playing with four fouls—got perfect offensive rebounding position on a missed shot and put in the layup to bring the score back to 48-46. Marion Local tied the game at 48 when Nick Tangeman hit a shot with 1:48 remaining. The Flyers then took their first lead in overtime when Bruns calmly converted both ends of a one-and-one with just 37 seconds left to play. Cornerstone Christian brought their fans to their feet when Ricky Adams hit a 3-pointer giving the Patriots back the lead at 51-50 with 24 seconds on the clock. 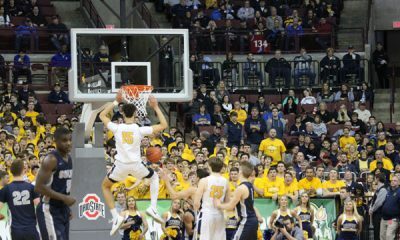 Marion Local ran down the clock and worked the ball inside to their big man Tyler Mescher and he was fouled with 2.6 seconds left to play. On the first free throw, the ball rolled around the rim and fell in, tying the game at 51. The second shot hit nothing but net and the Flyers had the lead. After timeouts by both teams, CCA inbounded the ball under the Marion Local basket. But with too little time left to set up a good shot, the Flyers prevailed for a scintillating 52-51 victory.